Eli Shmueli was born in Jerusalem in 1977 and still lives there today. He has a BA in psychobiology and an MA in neurobiology from the Hebrew University of Jerusalem. He also studied metaphysics and psychology, all while working at construction sites, psychiatric institutions, and as a porter, among other jobs. Over the years, he has worked at numerous low-paying jobs, usually via employment agencies. They exposed him to the human frailty and weakness which have become the focus of his writing. MarginsMan, Shmueli's first novel, is based on his experiences as a typist of zip codes at a postal distribution center. It received the Ministry of Culture Prize for Debut Novel (2015) and won Shmueli the National Library of Israel's 2016/2017 scholarship to encourage young Israeli writers. 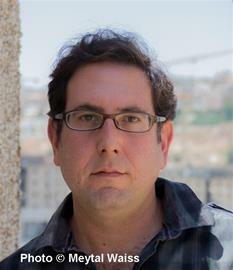 Shmueli also writes poetry and publishes political commentary in the daily Haaretz and in Palestinian-Israeli magazines.